In case it's not already obvious, a Press Kit gets constructed and released - to the press - as part of the marketing effort for a film. These days they're all done digitally, compiled onto DVDs. Back in 1990 it was a simple folder loaded with some 8x10 black and white photos and some photocopied production notes. Instead of focusing on a deleted scene today, I thought I would give typing a break and scan the contents of the press kit for the original movie. After I did that, I ended up typing 20 pages of production notes, so I really didn't save myself from anything. Below you'll find all of the photos included with the kit as well as an excerpt from the production notes. If you download the complete .zip file, you'll have more production notes to read. One of the reasons I went through with typing 20 pages of these things was that all of the information is really, really unique and interesting, and I'm not sure that there's anywhere else that you can read something similar to this. There are quotes from all of the major players who had a hand in making the movie, including the late and great Jim Henson. It's really all quite fantastic and I think it will also give you extra appreciation for all of the hard work that people put into this movie to make it the classic it ended up being. You can download the complete .zip file here. TMNT Deleted Scene: Training on the Farm - UPDATE! I've updated the original post with the "Training on the Farm" deleted scene with two more pictures that I just found. You can check them out fully here. "The Stack" talked to TMNT co-creator Kevin Eastman at last month's Comic-Con in San Diego about both Turtles and Heavy Metal. This isn't a new video, but I thought it'd be a good supplement to the TMNT Special Edition DVD effort. All movies are full of little mistakes that their makers hope the movie viewers won't spot, but if you watch something enough times and pay close enough attention, something's bound to stand out as not quite right. My long-time pal and fellow TMNT fan Karen put this video together last year in the wake of the excitement over the release of the 2007 CGI movie. With well over 600,00 views, it has become one of the most-viewed TMNT videos on YouTube and spent a weekend as one of Digg.com's top videos. While the video may highlight the mistakes in the film, I believe its popularity is a reflection of the general overall continued popularity of the movie. Surely enough popularity to warrant a Special Edition DVD release. 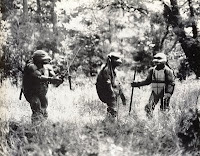 Here is the second deleted scene from the original Teenage Mutant Ninja Turtles film that I am highlighting in support of the TMNT Special Edition project. Warner Brothers isn't yet convinced that this is a good idea - But they ARE watching us! - so be sure to let them know personally that you want this Special Edition DVD! This scene is also pretty well documented, and bits and pieces of it can be seen in the actual movie. I've scanned a few stickers, trading cards, and pics taken from a book and magazine from this part, but the lengthy bit from the script might be more interesting to you. This scene comes immediately after April yells at Casey, "I wouldn't ask for your help if you were the last... "thing" on the face of the planet!" 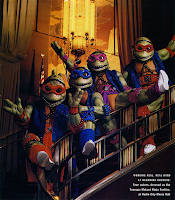 and Casey follows with, "Coming along 'nicely' ..."
This is the first entry in a series to highlight all of the deleted scenes from the original 1990 Teenage Mutant Ninja Turtles movie. While all of the deleted scenes from the movie are fairly well documented throughout books and comics, we still have yet to see any of these scenes in their entirety. This is a key reason why releasing a Special Edition DVD of this movie is a necessity! While the movie ended with our heroes triumphant on the rooftop of a building, there was one final scene in the script. This scene had April and Danny in the office of a comic book publisher, trying to pitch the idea of Teenage Mutant Ninja Turtles. Here are some photos from that scene, as well as the actual script that was used for filming! Now THIS is what should have been at Comic-Con last month!! 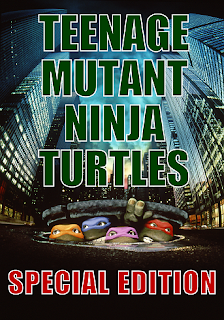 Stay tuned this weekend for the first major update concerning the TMNT Special Edition DVD campaign!! 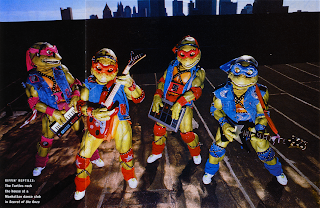 Fans have made half-hazard efforts to get New Line Cinema (and now, Warner Brothers) to release a special edition of, at least, the first Teenage Mutant Ninja Turtles film - if not all three - for many years. The response has consistently been, "We are not interested in that project." "...there has been quite a lot of blogging about a director's special edition of the first movie, particularly in the light of its impending 25th anniversary. I would be very keen to contribute to this idea if you thought it a good one. I have lots of original artwork and even a rough cut with a few extra scenes on tape. I think it would be nice to do a definitive release as the extras have always been very limited." This is not the first time Barron has made such a comment. In fact, a very similar comment was quoted in a Peter Laird, "Blast From the Past" Web site feature back in late 2001. With this new spark of inspiration from Murphy and Mr. Barron collectively, perhaps it's time to take the effort to make this project happen seriously. Next year is the 25th anniversary celebration of the TMNT - What better way to celebrate than with a special edition of one of the greatest highlights of that 25 year history? Emails from the same handful of fanboys/fangirls to Warner Brothers aren't going to convince them to change their minds about this project. It's time to get bigger and more visual. If you have graphic design skills or video editing skills, please email me if you're willing to provide hands-on help with this effort. Hmm, I never did post summaries of Saturday and Sunday. Well, there was nothing of real note to relate on the TMNT front, so I let myself be totally and completely overwhelmed and consumed by the rest of the Con. I'm still recovering, including a slight dose of illness, but it's nothing compared to how deathly ill I got after the Con last year. Anywho, here's a look at some of my TMNT swag from the Con. Here's what I think became my favorite TMNT acquisition from the Con. I was at the Heavy Metal booth, in Kevin Eastman's sketch line, expecting to get another Turtle sketch. But then I thought about it and it occurred to me that it would be pretty kickass to have a Foot Elite - one of the rare bad guy characters that I absolutely love - drawn by The Master. So that's what I asked for and that's what I got. 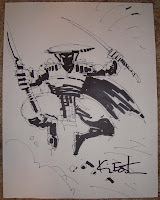 Not only is it kickass, it's also more unique than a Turtle sketch, of which I already have a couple. Speaking of which, here's one of them. In each Bodycount hardcover that Kevin sold, he was doing a full sketch of your choice in the front (assuming you were willing to wait in his constantly long line). There are many awesome things about Kevin, but I think it's particularly awesome that he is willing to do such sketches for anyone who asks and he also puts a considerable amount of time and detail into each sketch. And since he's such an awesome guy (and a millionaire), he never ever charges a fee. 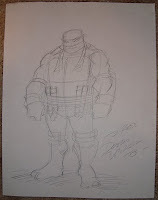 This last item of note is a sketch of Michaelangelo by my personal favorite of the new batch of TMNT artists, Dario Brizuela. There are many reasons why I love Comic-Con, and thus continue to attend. 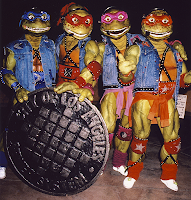 The TMNT swag is just a small part of it. Seeing and meeting people I respect and look up to is another small part. A big part of it is the awesome friends that I get to hang out with for the duration; for some of them it's the only time I'll see them for the entire year. But the other thing I love about Comic-Con is just the general atmosphere. For five days a year 125,000 people gather in one space to celebrate what can be summed up as simple geekdom. We are female and male, we are young and old, and we are all races and nationalities and species (can't forget those Klingons). We love comic books and movies and television and over the course of these five days, they love us back. For the minutes or hours that I'm standing in a line, I can hold a conversation with the person standing next to me because, even though we don't know each other and will probably never meet again, we speak the same language: Geek. And I think it's pretty awesome when you can do that with nearly any of the 125,000 attendees (and sappy, I know).